Morocco has improved its standing in the 2019 Index of Economic Freedom, issued by the Washington-based Heritage Foundation. Index of Economic Freedom measures economic freedom of 186 countries based on trade freedom, business freedom, investment freedom, and property rights. 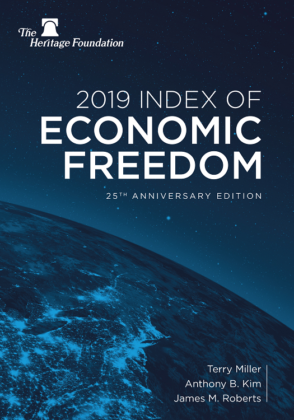 Morocco’s economic freedom score is 62.9, making its economy the 75th freest in the 2019 Index, while Algeria dropped to the 171th place. In last year’s standing, Morocco was ranked 86th. Thus, its overall score has increased, with improvements in fiscal health, property rights, and judicial effectiveness outpacing lower scores for government integrity, labor freedom, and trade freedom. The North African Kingdom ranked 6th among 14 countries in the Middle East and North Africa region, and its overall score is above the regional and world averages. Low labor costs and proximity to Europe have helped the country to build a diversified and market-oriented economy, said the analysts of the Heritage Foundation. They said the Moroccan government is taking additional fiscal consolidation measures to boost growth and improve private-sector competitiveness by strengthening public finances and introducing a more flexible exchange-rate regime. They described the Moroccan economy as an open market wherein the combined value of exports and imports is equal to 83.5 percent of GDP. The average applied tariff rate is 3.8 percent. As of June 30, 2018, according to the WTO, Morocco had 38 nontariff measures in force. Foreign and domestic investors are treated equally under the law. The Moroccan financial sector is competitive and offers a range of financing options while the Casablanca Stock Exchange does not restrict foreign participation.